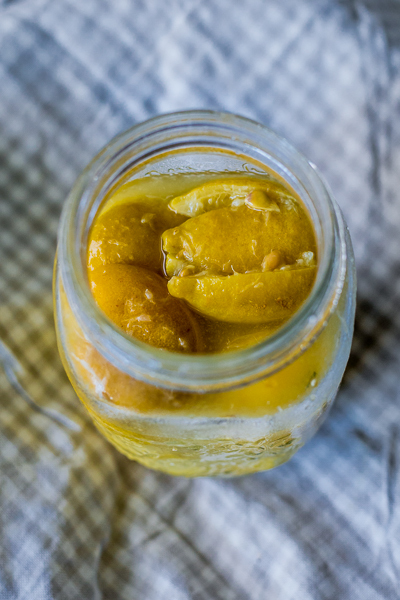 I’d been buying preserved lemons from a store that grows organic lemons on their property. I’m not someone that only buys organic produce, but the concept of using the entire fruit—peel, rind, juice and all—made me want to try and get my hands on some pesticide-free ones for preserving. So when my aunt called asking if I wanted lemons from her tree at home (the answer to which is always a resounding yes), I jumped at the opportunity to make a batch. My process turned out to be slightly more cumbersome since the lemons were underripe. I wrapped them in newspaper and placed them next to a bunch of bananas (this is a neat hack to ripen avocados too, or any fruit for that matter). It took a good four or five days to get them fully ripened and good to go. 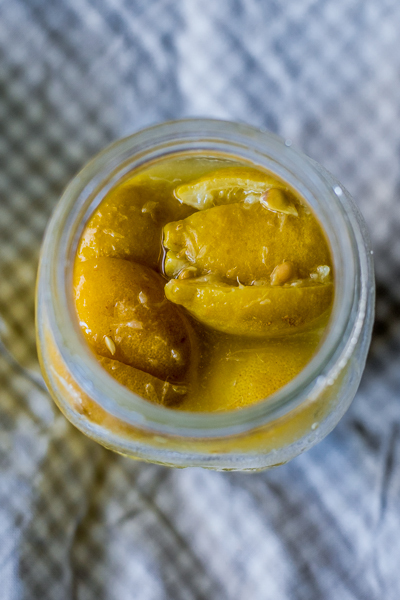 The preserving process is simple enough: you quarter each lemon almost to the end but still keeping the base intact, fill liberally with salt, and keep layering into your jar, pushing them down firmly as you go. Then add more lemon juice to completely submerge them. This brine-y lemon juice basically breaks them down. At the end of the ripening (preserving) process—about 10-15 days—you’ll notice the skins shriveled up slightly and they will have gotten softer. At this stage, they’re ready to go: you simply take one out the jar, rinse, and use. 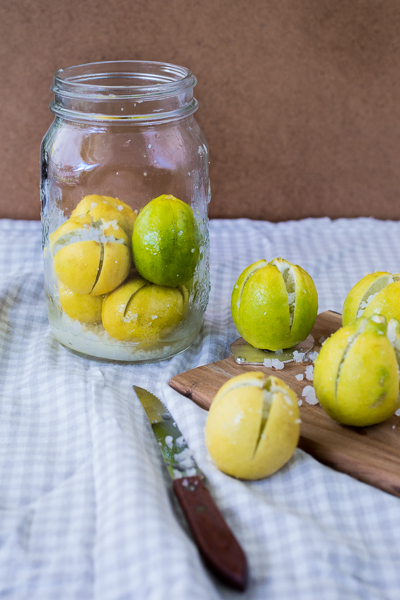 Also a good upcycling trick: once you go through all the lemons in the jar, retain the lemon brine and reuse for the next batch, adding more lemon juice if needed. Recipes like these give me immense joy. 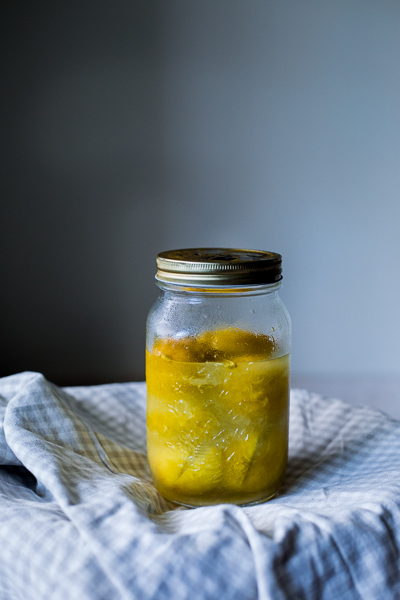 The pickling process tempers the tartness of the lemons and gives you an extra dimension of flavour—an intense, fragrant lemony hit to anything you add them to. A little bit goes a long way in elevating marinades, salad dressings and stews. I’m currently dreaming about using them in Turkish eggs. I don’t know how yet. We’ll see how it goes. Note: it’s common to see a white lacy coating on the top layer of lemons a few days into the ripening process. This is normal. Just make sure to completely submerge it in the juice and rinse it out thoroughly before using. Thoroughly wash and dry 8 lemons. Quarter each lemon almost to the bottom, but making sure it still remains attached to its base. 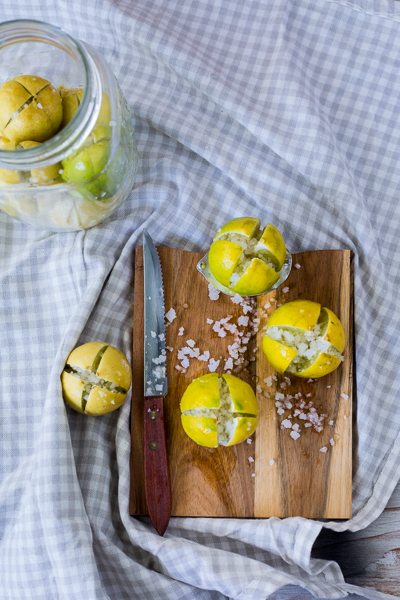 Fill each lemon liberally with salt, turning it around and making sure that the insides are completely coated. Add a layer of lemons to the jar and squeeze each one down firmly with your hands to get a lot of the juice out. It might flatten out a bit in the process but that’s fine. Add another layer of the lemons on top and squeeze down again. Juice the remaining lemons and pour enough juice to completely submerge the lemons in the jar. (You might need more juice for this depending on size of jar). Leave the jar in a dark corner of your kitchen and let it sit for 7-8 days. 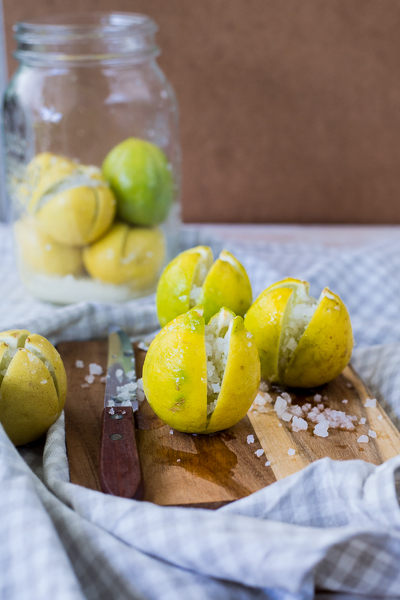 Tamp the lemons down with a wooden spatula every 2 to 3 days, making sure it’s fully submerged during the entire duration of time. Once ripened (the lemons will have softened and shriveled slightly), refrigerate. Stays good refrigerated for up to 1 year. Simply remove a lemon from the jar and rinse before using. - It is common to see a white lacy coating on the top layer of lemons a few days into the ripening process. This is normal. Just make sure to completely submerge it in the lemon juice and rinse it out thoroughly before using. - Once you go through all the lemons in the jar, retain the lemon brine and reuse for the next batch, adding more lemon juice if needed.